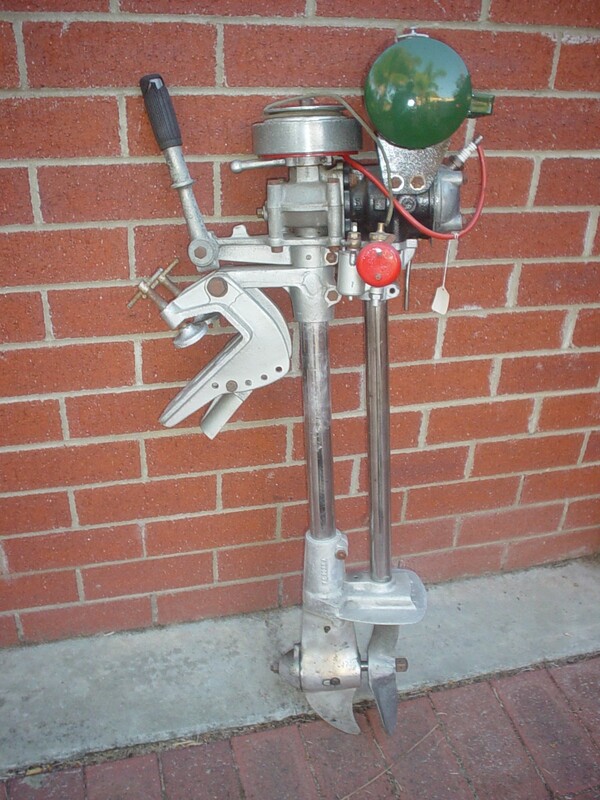 A page devoted to vintage, mainly British outboards, other than British Seagull. 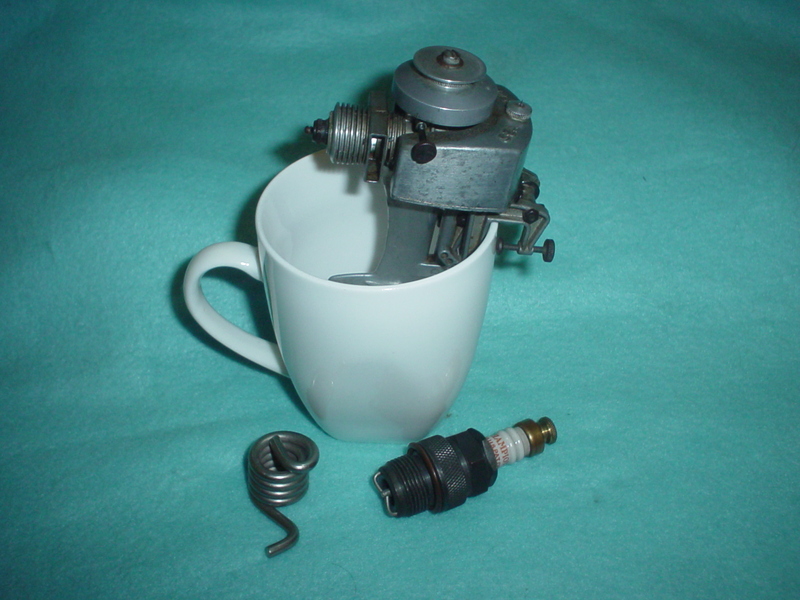 On this page I will add snippets about other makes of old outboard that come along, in case it might help someone find another enthusiast, identify a motor or find out if there are any spares anywhere! 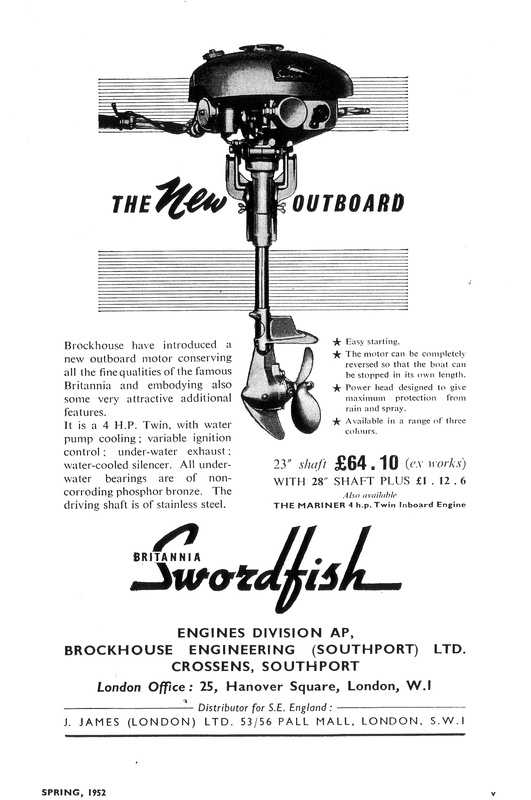 I include these adverts from the 1950's, as so many ask me if I know anything about them.... sadly I do not, so this was useful to me as well! 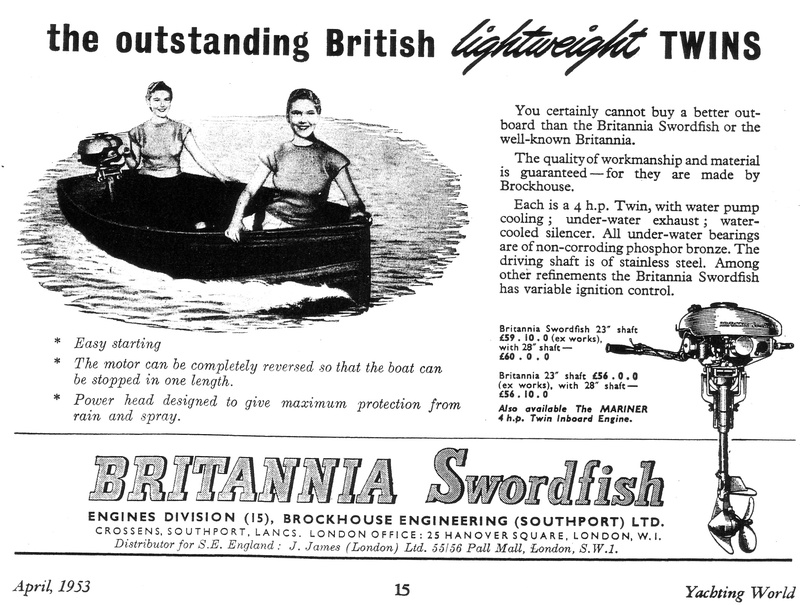 The Britannia Swordfish and the Anzani range.. Thanks Andrew! 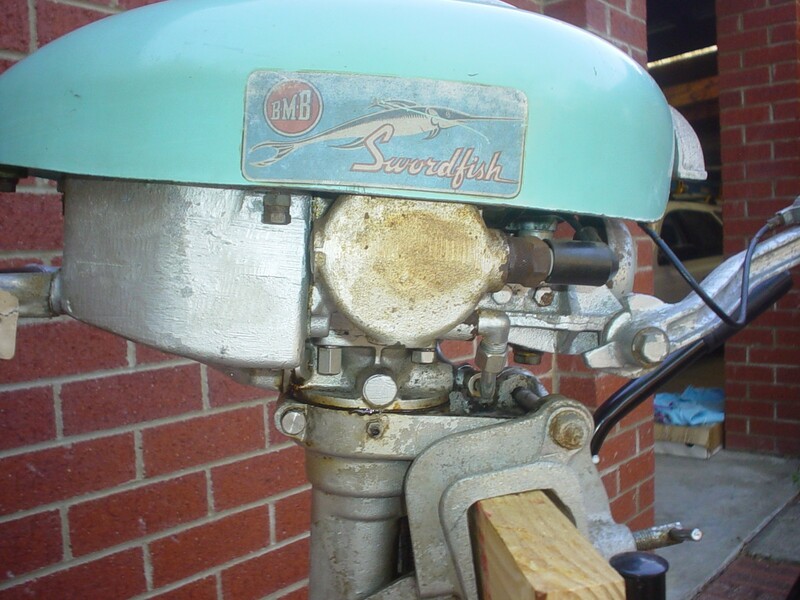 These two pics of a Swordfish sent in by Bruce in Australia. apparently been stored since day one with a misfire, when Bruce took one of the plugs out, it was broken internally! 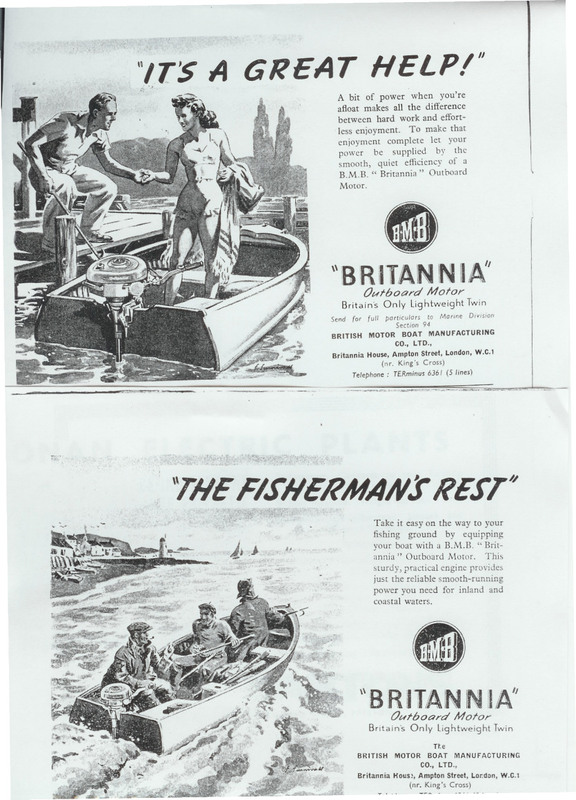 Thanks to Steve Green in Australia for these adverts for the Britannia. 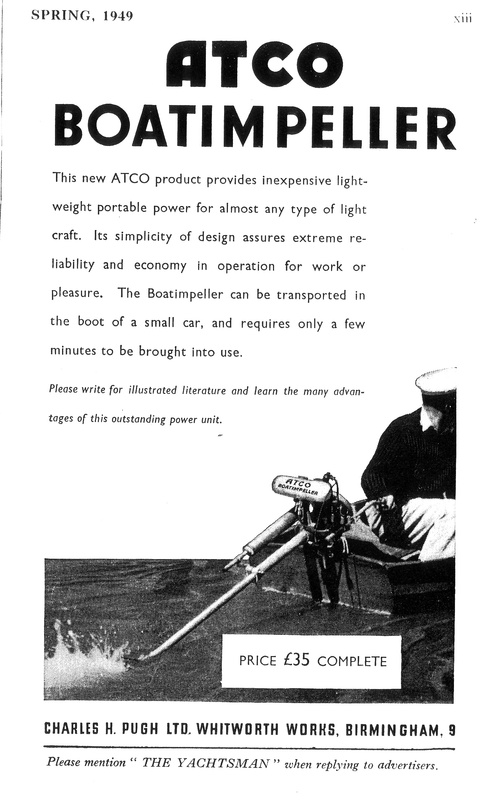 I was pleased to see the Atco Boatimpeller, as I know at least one of you has one! 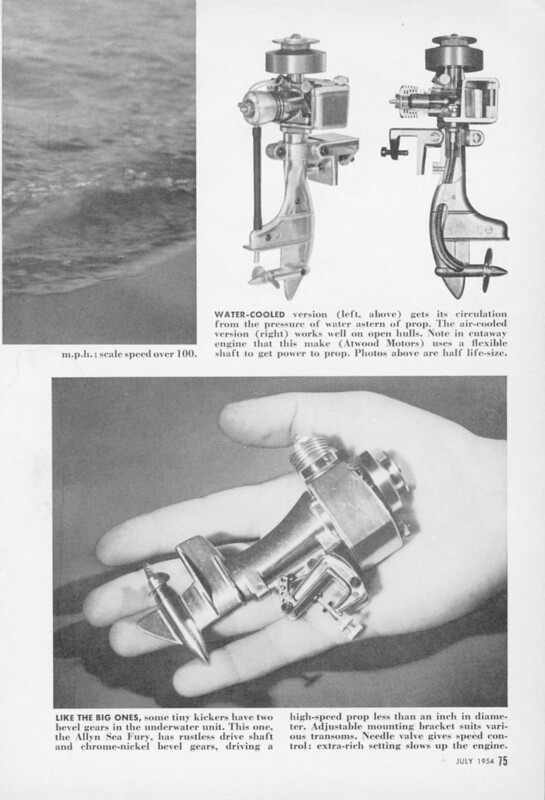 So When Andrew sent me these pages from the 'Yachtsman' magazine, 1949, I had to scan and OCR it to extract the following article! ATCO Motor Mowers shave luxuriant lawns throughout the world. 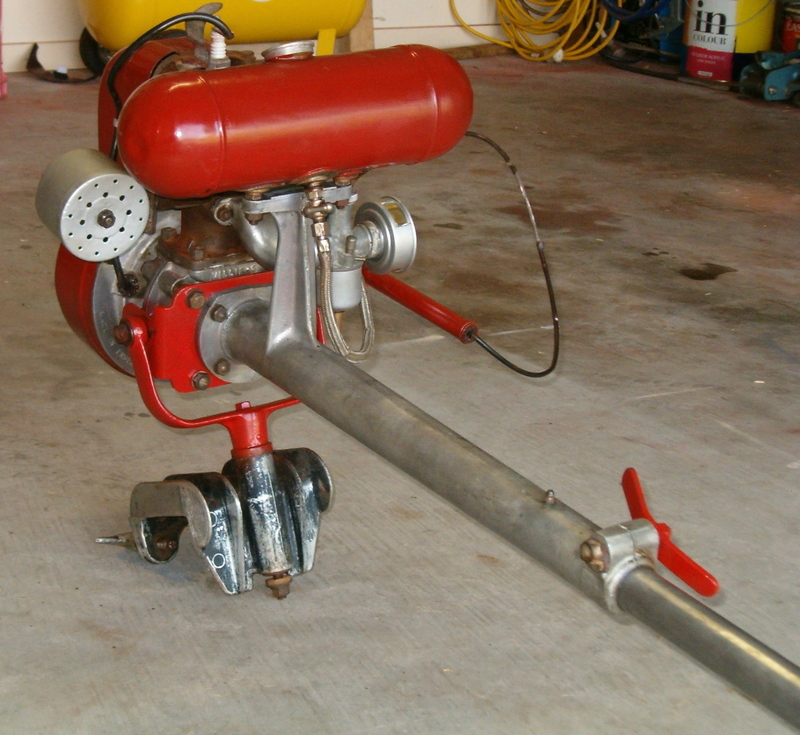 It was to be expected, therefore, that the makers of Atco products, Charles H. Pugh, Ltd., would not bother to enter the outboard motor field without having a worth-while contribution to make. 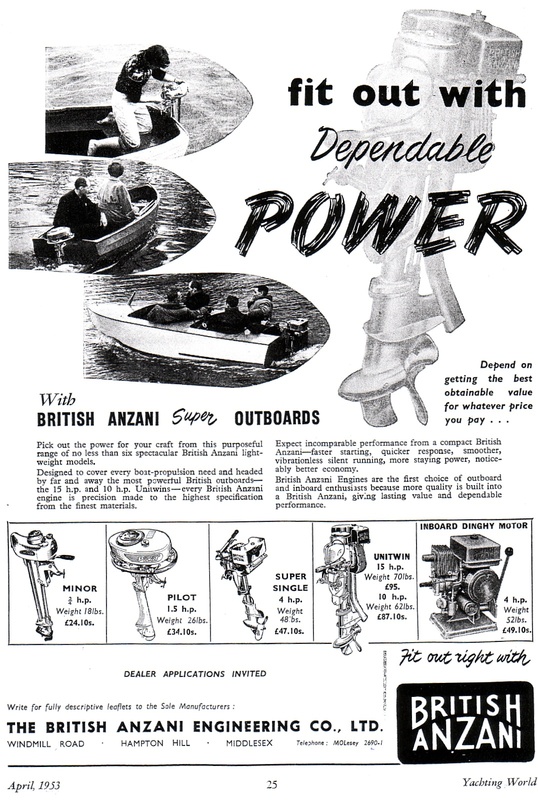 That, however, is not our reason for devoting our precious editorial space to a description of this engine, for there are several admirable and worth-while outboards on the market at the present time ; the Atco Boatimpeller involves new principles, and for that reason appealed to our inquiring natures as boat owners-not motor engineers. As usual, much literature and many photographs were available, but we decided to try this engine for ourselves. 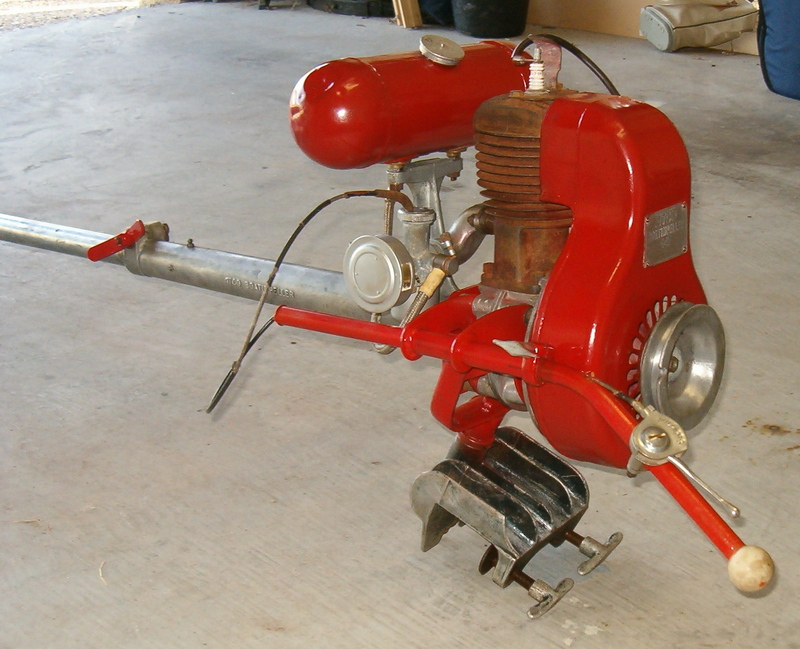 Briefly, the engine is an air-cooled, two-stroke, single-cylinder unit of 79cc., weighing 38 3/4 lb. 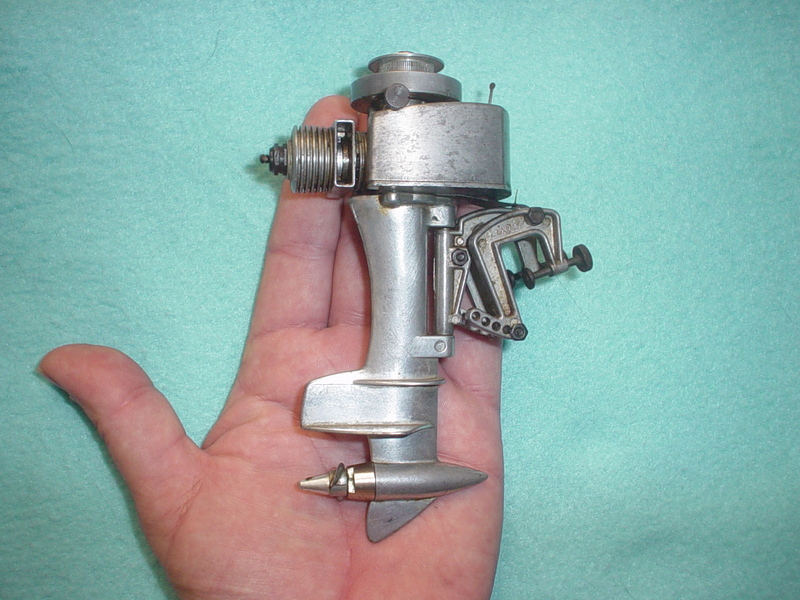 The engine, tiller and main shaft housing measure 32 in. 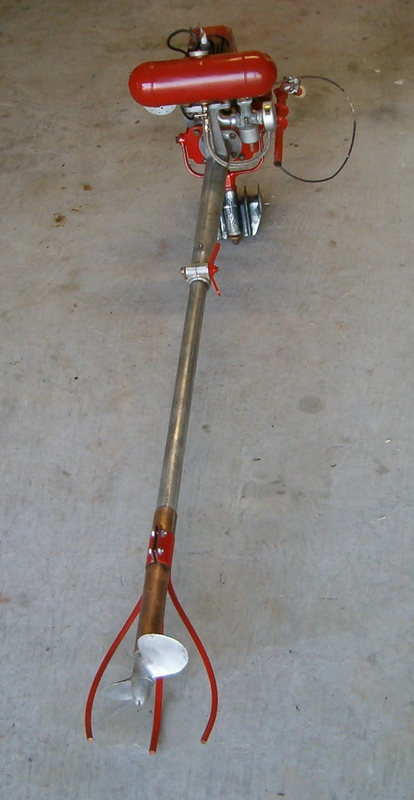 overall, but, as well as this, there is an additional length of shafting with the propeller unit, which is detachable-this weighs 5 1/4lb. and is 341/2 in. overall. 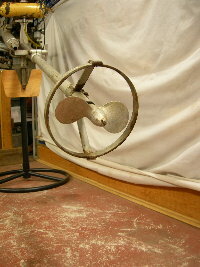 engine is coupled directly by means of the shaft to the propeller; there are no bevel gears and thus none of the friction which goes with them. 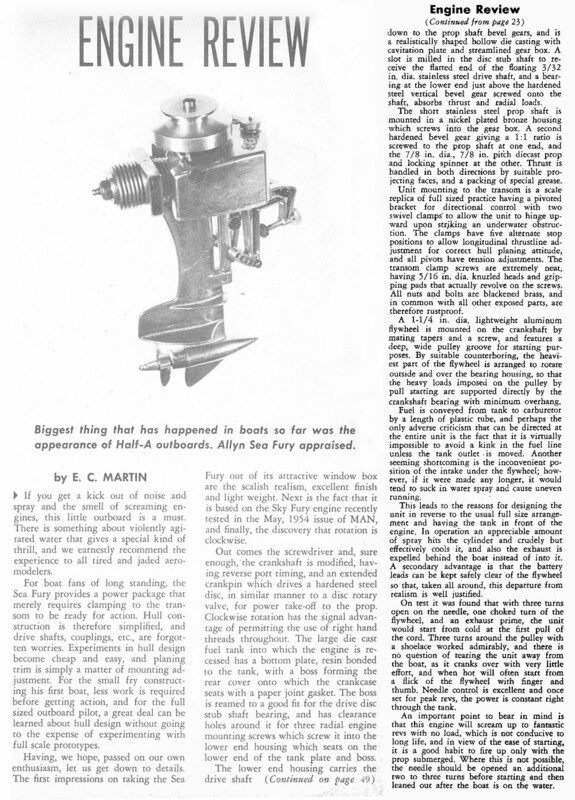 As far as purely mechanical details are concerned, suffice it to say that all the materials used in this machine seemed to be suitable and adequate for their task. Further details of this nature may be obtained from the makers' catalogue. Our aim is to tell of our experiences with it. photograph, which is reproduced here. 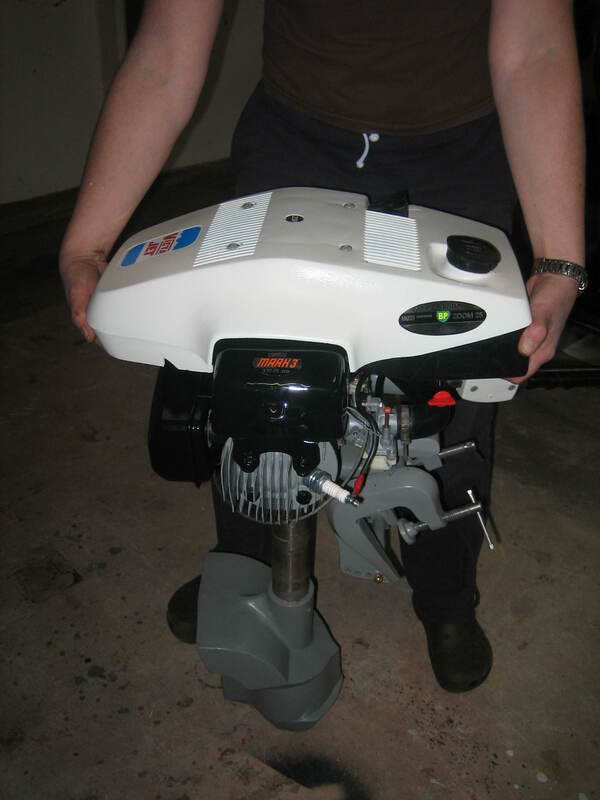 With the usual mild concern and inquiring interest gained over many years of experience with outboard engines, we wound the cord around the fly-wheel. Such engines either do or they don't. This one did at the second pull. Starting is exceptionally easy because the engine is relieved of resistance by having the propeller clear of the water. We were intrigued by the propeller whirring round within its guard over the centre thwart ; there it might fan the fevered brow or chip your potatoes, or simply remain parked until you carried your boat to the water and floated her. 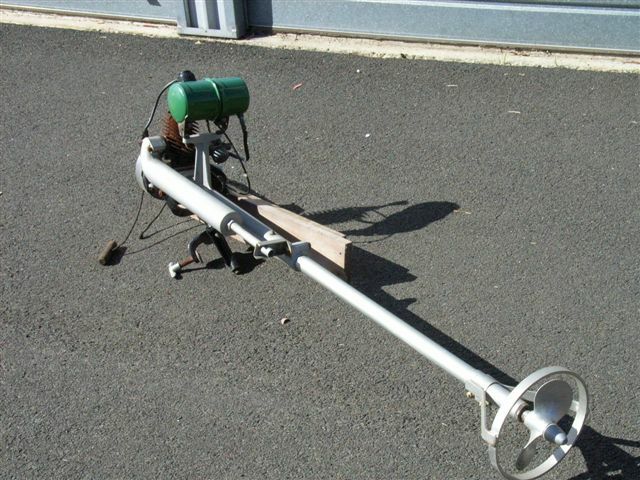 We went afloat, swung the unit round and immersed the propeller ; immediately the thrust of the propeller was felt, the weight of the shaft was counterbalanced and no pressure was required on the tiller to keep the shaft from dropping at too steep an angle. We progressed upstream-not fast, but at a speed adequate in respect of the capacity of the engine. The shaft made an angle with the surface of the water of about 30 degrees, thus the thrust was upwards as well as forwards ; this upwards tendency of the thrust, transmitted to the top of the transom, tended to lift the engine was thereby counterbalanced to a great extent. 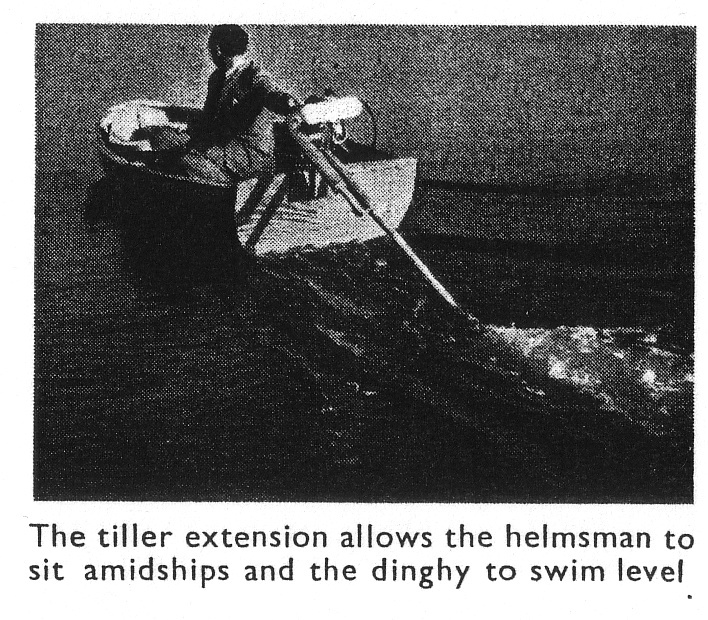 As a further factor towards keeping the dinghy floating level, was an extending tiller, which could simply be pushed in and out at will and ' thus enabled the helmsman to dispose his weight to the least disadvantage. We slowed the engine to estimate stalling speed. We stalled at about 500 r.p.m. We simply depressed the tiller to bring the propeller clear of the water, and spun the fly-wheel by gripping it and flicking the wrist ; the engine restarted at the first attempt. Normally, it runs between 1,000-1,600 r.p.m. 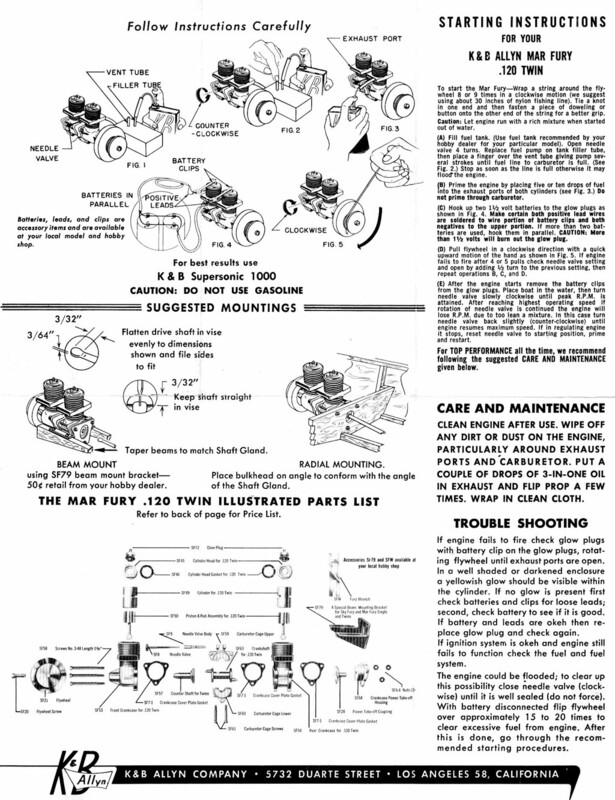 and engine wear is therefore naturally less than is the case with a high " revving " engine. 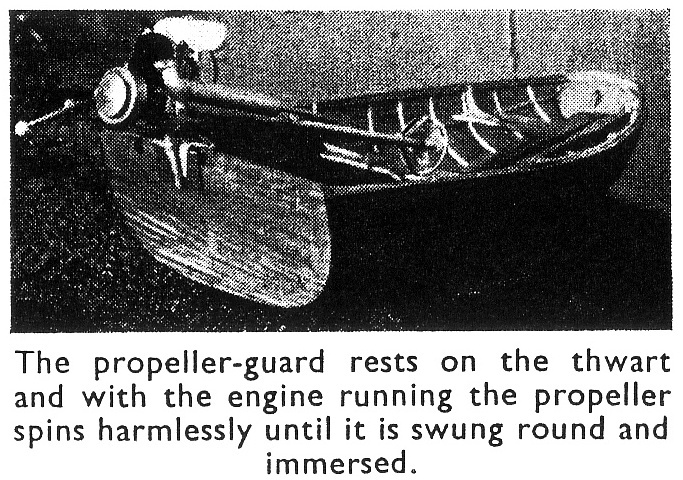 When manoeuvring, we found that the speed and steering of the dinghy could be precisely controlled ; the method we adopted when approaching a landing stage was to select a reasonably slow throttle setting and then control the speed by raising or lowering the propeller in the water, so that, to get very low speeds, only the tips of the blades were immersed and working. Steerage is also positive at very low speeds, for the propeller may be simply dipped in momentarily with the helm over in either direction to thrust the dinghy round regardless of whether or not she has normal steerage way. There is, of course, no reverse. We finally ran in to the beach and walked ashore dry-footed, for the propeller can still operate in only a few inches of water. 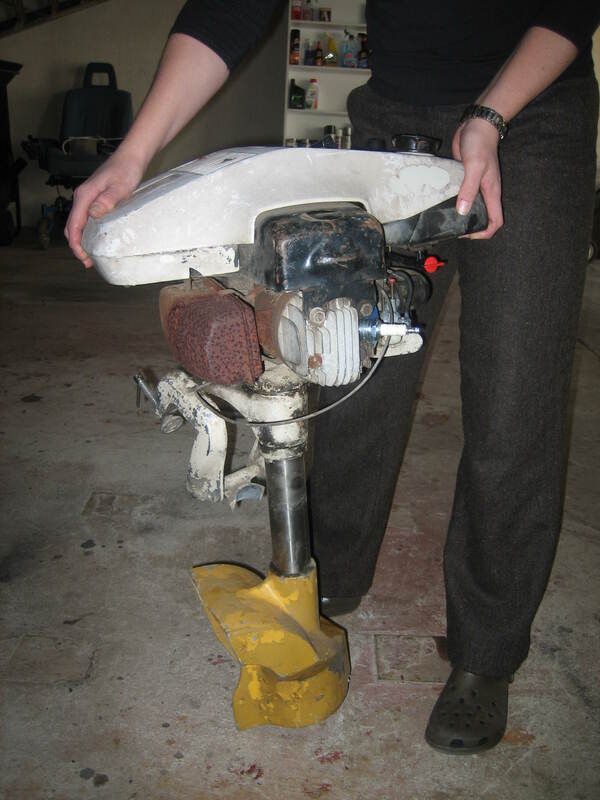 With the dinghy's bow on the shore, the propeller guard was allowed to rest on the beach bottom with the propeller just immersed and ticking over so that the dinghy was kept safely on the shore and not permitted to drift off. As a last ingratiating act, the Boatimpeller once again resolved itself into two pieces and was stowed away in the boot of the car, with no dribbles of cooling water gushing out at awkward moments. We parted good friends-in fact we were sorry to part at all. Under certain conditions this unit has obvious advantages, especially where the water may be shallow or weedy. 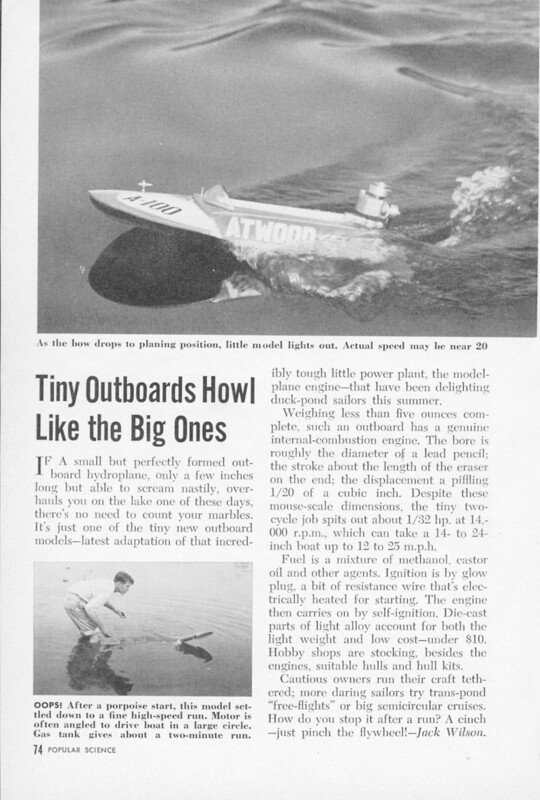 This extract was first printed in the ‘Yachtsman’ Magazine Spring 1949. Thanks to Andrew Dawson for sending it in. 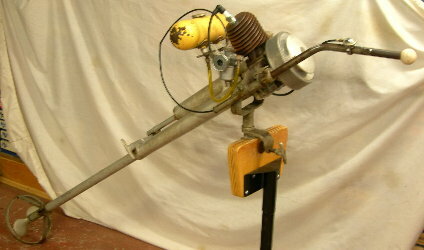 Cylinders: 1Bore: 45mmStroke:50mmIgnition:VilliersPoint Gap:.020Cooling:Air - free flow Condition: Unrestored Retail price when new: $125.00 (USA) Weight: 44 lbs. This article from Art Sesselberg, in the USA. Here is a link to his site for more. 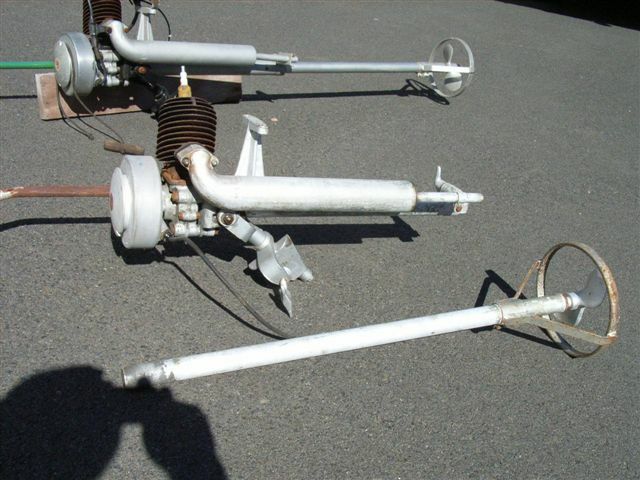 These two pics of the Atco boat impellors have come in from Steve in Australia. You can see how they were simple to stow in the car, even if they looked unwieldy on the boat! 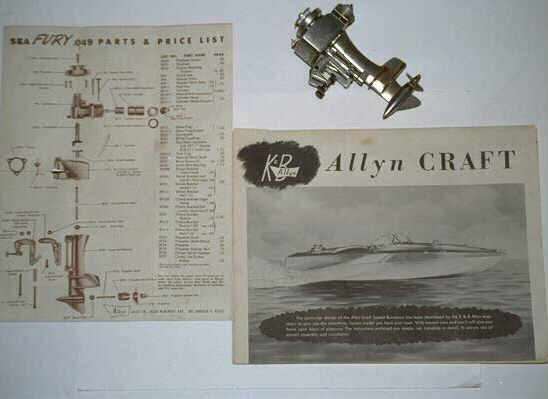 The SOS site is getting to be where so many look to get info about old motors and I am getting more and more pics of them sent, so I will add them to this page for the time being! 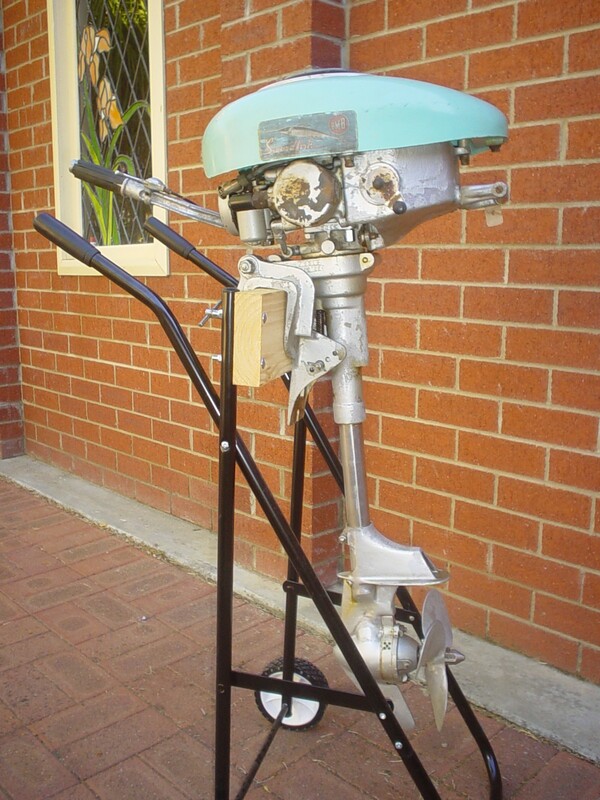 this nicely restored motor is from Australia! 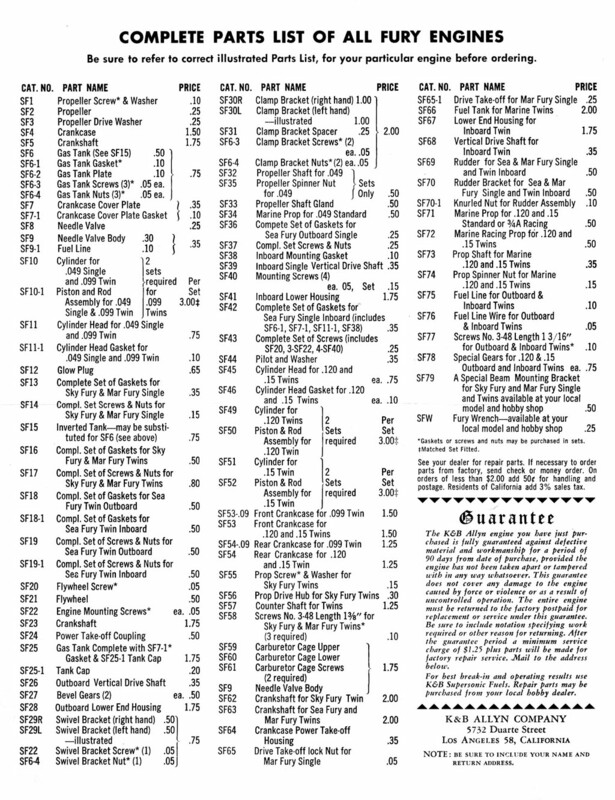 I love you web site, it’s interesting to see there is so many models and it’s great to see people taking an interest in these old motor of history. 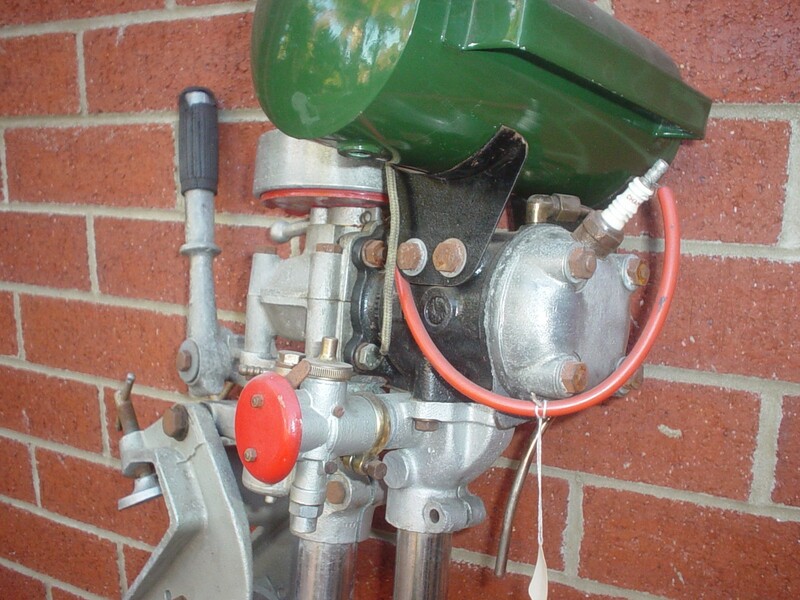 I have attached a picture of an Australia made Victa lawn mower engine that was adapted to a jet unit back in 1974. Bruce in Australia sent this in I could not resist adding it! I like the idea of scale with a British Seagull spring! 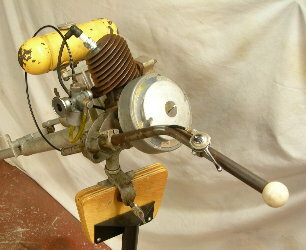 Another from Bruce, this time a 'Ferrier', anyone know anything about them! Bruce has also found a load more British Seagull adverts, which he is scanning to send to me for the site. What a gent!